Back in ’63 I was a kid at the elementary school in a small town on Long Island. My biggest concerns in life were the batting order for the neighborhood stick ball game…whether or not I had Mickey Mantle’s baseball card and whether I had enough change to get an egg cream up at Baker’s…the local luncheonette. It was a chilly bright autumn day in November that year. We were sitting in class listening to a history lesson when the principal of the school burst through the door in hysterics, tears streaming down her face…”they shot the President…they shot the President!”. I can hear her trembling voice as clear as day even now. I remember thinking, “Who shot the President? He was a pretty cool guy who people liked. Why would anyone shoot him?” and so the innocence of childhood was dealt a major and irrevocable blow. In the days following my fragile sensibility of what life was all about was smacked around pretty good. In the middle of a stickball game out in the street, someone came rushing from their nice quiet suburban home once again with a terrified howl..”someone just shot Oswald! Some one just shot Oswald!”. Wow…really? Now I had heard this bad guy was the guy who shot the President, but don’t they have to have a trial or something before someone kills him? And then I thought…what if he’s not the person who shot the President? That would be a terrible thing.” I was awoken from my daydream in the street to the sounds of a friend yelling, “Ref…you’re up!”. Oh yeah. My turn to hit. As the days went by the people around me seemed like they were walking around in a non-stop haze of tears and disbelief. I remember the “grownups” saying they couldn’t believe sucha thing could happen and I was feeling like they were right. How could something this horrible happen….in real life…on TV in front of the whole country? Someone killed the President and then someone killed the guy who they said killed the President. The shock was so immense we all just looked at each other in a fog. I remember the pomp and ceremony of the President’s funeral. Everything was BLACK. It seemed like for a few days that color reflected how we all felt. I understood that this event I was living through was beyond huge. It was global. There were leaders from all the big countries in attendance. 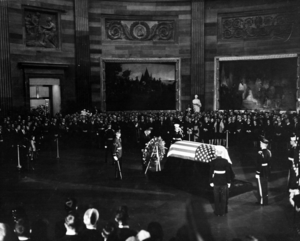 There were what seemed like milkes and miles of mourners on the street and filing past the coffin that was lying in state in the Capitol rotunda. As a little kid I was taken in by the strict military rituals and the stoic nature of the people surrounded and cloaked in terrible grief. For the first time in my very young life it became very very obvious that death was forever. There was no coming back. There was no negotiation to make it better. There was just sadness and loss. I never had to think about death in that way before. At that young age no one I had known had ever passed on…at least no on close…no one in the immediate circle of family and friends. I felt the fear of being separated from family in the way President Kennedy had been cut down from his. Politics never came into it. Conspiracy and reasons for the death were never discussed. It was all about death and loss. 50 years is a long time. That little kid is an old man now. So much water under the bridge. So much life has been lived. The perspective on John F. Kennedy’s assassination has changed from one of chaos and fear to one of a sadness from afar. This distance allowed me to weigh the changes to society that his death brought upon us. The beginning of a decade of such boundless societal energy and hope dashed in a few moments on a sunny afternoon in Dallas. Any for what reason? Now I turn my look at the many varying accounts and explanations for this unspeakable act that moved the country in such a different direction from where we thought we were headed. Kennedy had ideas, Kennedy had plans and Kennedy had the energy and charisma to get things done. Such a wasted opportunity. None of the people who have followed Kennedy during the last 50 years have been able to move the country in the direction he saw. Reagan and Clinton were close…Obama rode a wave of good feeling but has proven to be a most polarizing figure at a time in US history when left and right are waging a battle royale for control of the government. Politics were different in Kennedy’s era. Though there were hard fought differences, the public and governmental discourse was civil, respectful and worked in a spirit of cooperation unlike the fiasco unfolding before our eyes. Substance-less headline grabbers are nothing more than a bunch of silly sloganeerss and closed minded populists looking to the past when they should be looking to the future. Kennedy embraced the future. He saw the potential and he had planned on doing whatever was necessary to bring the country into that future. A shame for the lost opportunity. Who killed Kennedy? The CIA? The communists? The Mafias? Was the fatal shot an accident? All of these various angles have been looked at and debated for 50 years. We all have our opinions. My opinion is that based on the evidence and the expert testimony I have seen and heard in the media all these many years, it seems fairly reasonable to assume Lee Harvey Oswald didn’t do it himself…if he in fact he did it at all. But what’s the point of the arguement ? At this point in time the speculation on the who what and why is mere entertainment. The real consequences of the deed are cold and passed over by a world that has turned many times since. I’ve read a bit and studied a bit on the life of this fallen President. He has inspired me in some ways and had me look the other way in others, but there is no denying he had a profound effect on my life and the lives of many people of my generation. 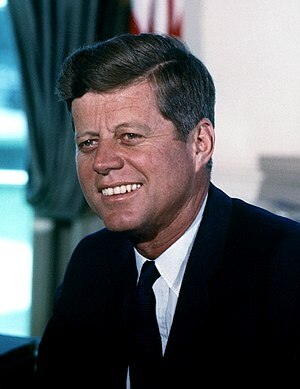 We all remember where we were when we heard the terrible news that our young vibrant President John F. Kennedy had been gunned down. The event set the stage for an American climate that continues to evolve and change even after 50 long years. This entry was posted in Bio, Politics, Pop culture and tagged Assassination of John F. Kennedy, John F Kennedy, Lee Harvey Oswald. Bookmark the permalink. Nice blog, Joe. You remember a lot more than I do, and I appreciate the detail. I was a little younger (a couple months short of 7), and I remember being stunned, but not knowing how I should react. Once they announced it at my school, they sent us home. The older kids on the bus were crying. I just sat quietly, trying to process this horrible event. America really lost its innocence that day. How a man who inspired us with so much hope could be cut down in his prime: WTH??? Who would do that? 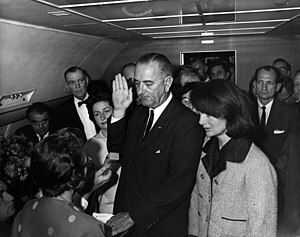 Jackie held herself up so well, I really don’t know how she did it, but she was a role model First Lady. Of course, none of us will ever forget the photo of little John-John saluting as his father’s casket went by. Just thinking about it brings tears to my eyes. And of course, he was another Kennedy we lost too young. The ’60s were such a turbulent decade, yet they really ushered in a lot of positive change. LBJ, perhaps out of guilt or out of gratitude that the news that was about to befall him was sidetracked by this event (he was about to be front-page news for some very shady dealings, and told friends his political career was done), worked Congress to get the Civil Rights Act and Voting Rights Act passed in JFK’s honor. (That was his signature legislation at the time of his death.) Medicare was also passed then. They are some of our most progressive laws. It was like America’s Age of Enlightenment. But with great change often comes great angst by those afraid of change. The end of the decade brought more shocking events, with the assassinations of MLK and RFK. 1968 was a pivotal year. I remember watching the civil rights demonstrations, the nonviolent protesters, and seeing how the police in the South sicced their dogs on them and turned water hoses on them. I remember saying to my mother, “Why are they doing this? What’s going on?” And she told me it was because blacks wanted to be treated equally, they wanted to sit at the same lunch counters, and vote, and use the same bathrooms. I remember being horrified that they weren’t already doing that, and I couldn’t fathom treating them differently. All these events really affected my attitude toward civil rights from a very young age, and caused me to be interested in Constitutional law and civil liberties law. If you think about it, those of us who were alive in the ’60s experienced the very best and the very worst of society, its greatest promises and its deepest depths of despair. Despite the bad stuff, though, I’m so grateful for the good stuff. I think the ’60s had a profound effect on all of us, especially those who lived through that decade. I know it did on me. I also was in that era and actually watched Ruby shoot and kill Oswald on my parents TV. This was something that was engrained in my mind for life. There are many theroies and it has been said that the full story will be revealed in 2131. They made sure no one who lived it will still be around. I have been intrigued by this since the inception and of all the stories, speculations and theories, the most believable one that I have seen so far is a fictional movie called “Executive Action” circa 1973. The trailers for the film never ran on certain television stations, including WNBC-TV in New York City. The criticism of the film and its suggestion of an industrial complex conspiracy led to the film being removed totally from the movie theaters by early December 1973 and getting no TV/Video runs until the 1980s and mid-1990s, when it got legal release and distribution for TV and video. The film was originally released on November 7, 1973, almost two weeks before the tenth anniversary of the JFK Assassination. I remember it being banned from theatres and always wondered why. Too true?, Too revealing?. Wonder, wonder. All I know is if Zapruder hadn’t filmed that fateful day with his 8mm camera and caught the evidence, it would have been assumed Oswald was the lone assasin and it would have been put to bed. On that sunny day, this country changed drasticly forever! The main memory of that time was not so much the specific incident as much as the overall sadness and dismay shown by my parents and other grown ups. The black and white tv being on for hours and hours. The feeling of what’s going to happen next. I guess the Don Henley song title sums it up, The End Of The Innocence. I saw two really interesting TV shows this week. One was an in-depth investigation of the assassination done by Jesse Ventura. Never knew all that much about him except as a wrestler and then governor but his attention to detail and his insight into the event were pretty amazing. The other show I saw made the case that the shot that killed JFK was accidentally fired from the CIA agent’s rifle behind Kennedy’s car. Wish I could remember the name of the show…there were so many this past week or so…but it was amazing and another eye opener. It’s a sad memory and as the years have passed I think the country would have been moving into a much better place, a much better frame of mind had he lived.